We released another FREE eBook for folks to download. 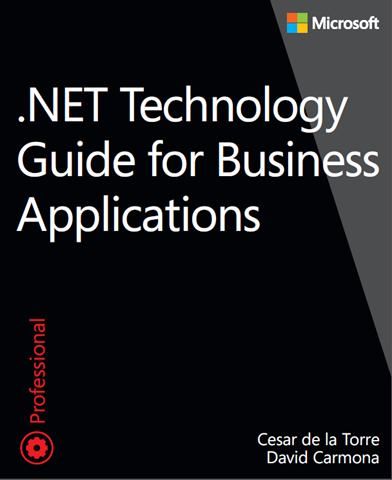 This is a shorter, 70pg, 6.0MB book targeting architects of .NET applications called “.NET Technology Guide for Business Applications”. Select your architecture approaches and development technology based on your specific application’s priorities and requirements. A single architecture and approach won’t work for every type of application. The Microsoft development stack and .NET are extremely flexible and offer many possibilities, but it’s essential that you choose specific approaches and technologies based on the kind of application—or even subsystem—you build. Each application will have very different priorities and tradeoffs that must be taken on different paths. Business application modernization goes further than simply building mobile apps. Mobile applications must rely on and extend your foundational business applications. To be successful, mobile apps must be built with deep integration into your current foundational business applications. Mobile business apps should be part of the larger enterprise ecosystem and substantially extend foundational business applications, whether the foundational systems are established legacy applications or new, large, mission-critical applications built with innovative, scalable, and elastic services. Positioning your application or subsystem within a global patterns segmentation will help you to choose the right approaches and technologies.